Hidden inside Lake George, New York is a small body of water with a name that shatters the picturesque atmosphere which traditionally draws thousands of visitors every year. 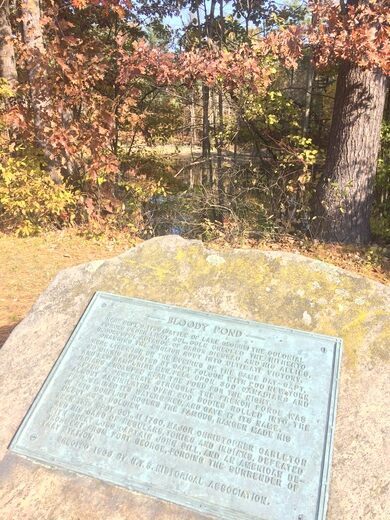 Bloody Pond has been around centuries longer than the restaurants or shops that cater to the area’s visitors and earned its name after a brutal 18th century September afternoon after the Battle of Lake George. It was on this day that British, Native American, and Canadian troops clashed near the banks of the small pool. To be exact, on the evening of September 8th, 1755, Nathaniel Folsom’s company of the New Hampshire Provincial Regiment and the New York Provincials under Captain McGennis discovered Native American and Canadian troops in the region and the resulting fight took the lives of between 200 and 300 men. Their bodies were then rolled into the pond staining the water a deep red, and forever branding it with the name of Bloody Pond. This gruesome wartime scene is almost hard to imagine among the lovely forest vistas currently surrounding Lake George but thanks to early America’s penchant for morbid names, visitors need never forget the grisly bloodshed that once painted the land red with the blood of the fallen. Honor the dead, long live Bloody Pond! An Adirondacks museum housed in the former studio of Marcella Sembrich, the 19th century opera star most famous for her role of Mimi in "La Boheme."